I didn’t find my happy place watching this. 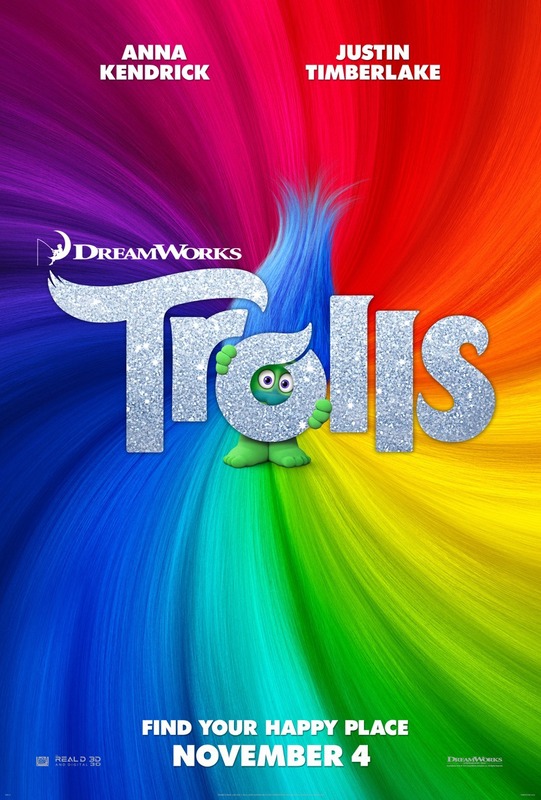 After the Bergens invade Troll Village, Poppy (Anna Kendrick), the happiest Troll ever born, and the curmudgeonly Branch (Justin Timberlake) set off on a journey to rescue her friends. Curmudgeonly? Word of the day. Had to grab a dictionary for that little doozy. That’s what you get for “borrowing” press releases. Anyway . . . I had to laugh at the irony that the singer cast in the lead role voices a troll that won’t sing (Well until 70 minutes into the film). This really is one for the little ‘uns. I couldn’t take the sugary sweet highly saturated animation with its ever-so-corny life messages. An insulin overdose for this diabetic. It certainly didn’t win me over when a group of glitter-clad trolls were shooting glitter bombs out of each other’s backsides. Too much! How does Russell Brand still get in movies? He’s like a foul stench that won’t go away. It was a toss up between him and James Corden for most annoying British comic to voice a troll. I could feel my hopes fading fast and that was only in the first 15 minutes! I actually prayed for them to be eaten by a Bergen. Director Walt Dohrn made more of an impression in his hilarious and tragically small cameo as the (appropriately titled) Cloud Guy. Give me five! Woah. GEAR SHIFT! BUT that’s not to say that the film didn’t have its moments. I couldn’t think of anybody better than Pitch Perfect’s Anna Kendrick to take on the role of Princess Poppy. Belting out some cracking medleys that meshed up Earth, Wind and Fire, Junior Senior and Simon and Garfunkel. A crazy mix BUT it worked. Even my grumbling subdued for those sequences. He worked well with Kendrick and the pair made an entertaining duo. Poppy’s mad energy and infectious enthusiasm battling Branch’s endless paranoia and pessimism. I tried not to pick at the flimsy story line. Some guff about Bergens eating trolls as their source of happiness. A Bergen can never be happy if they have never tasted a troll. Really? They seemed pretty happy hunting them and cooking them. Christine Baranski (The Good Wife) played the dastardly Chef with aplomb. Determined to hunt down all the trolls to save herself from exile. Christophe Beck’s soundtrack choices were excellent. I didn’t expect to see the Bergens slumping around to Gorillaz’s Sunshine In A Bag. Apart from JT’s (Oscar nominated) toe tapping Can’t Stop the Feeling, the original material left little to be desired. It didn’t help that Kendrick’s voice really grated against me while singing ‘Get Up Again’. The silly little subplot involving King Gristle (Christopher Mintz-Plasse) and his hand maiden Bridget (Zooey Deschanel) was entertaining enough and made up for the lacklustre journey. I expected a bit more of an adventure. They got to the Bergen kingdom pretty quickly which made me think that they didn’t hide that well in the first place! Deschanel was funny as the ditsy Bergen desperate to catch the king’s eye. Her attempts to woo him were comical. Her rendition of Lionel Richie’s Hello had me in stitches. I didn’t even recognize The Big Bang Theory’s Kunal Nayyar as the auto-tuning troll Guy Diamond. Maybe that was a good thing. It was a movie of moments. There were some good ones and some bad ones. It was watchable enough and killed the time BUT memorable? It had enough to entertain the little ‘uns BUT the bigger kids . . . Well. I’d recommend Sing instead. BUT I’ll let you be the judges. Brilliant, heartwarming, an unexpected treat. Fifth grader Jesse Aaron’s (Josh Hutcherson) hopes of becoming the fastest runner in his class are dashed when new girl Leslie Burke (AnnaSophia Robb) outruns everybody, including him. However, they soon become friends and create an imaginary world called Terabithia, filled with fantastic creatures. Firstly, I will admit that I have never read the book so I cannot make comparisons. BUT . . . The most important thing when watching this film is to remember being a kid. As soon as the pair embark into the forest and create Terabithia, it made me nostalgic of when I once played crazy adventures in the garden. At first, we see the kids using their imagination and pretending pine cones are grenades BUT as they keep going back, the forest becomes bigger and bolder. Their imaginary kingdom comes to life. The special effects are varied, from slightly cartoonish to visual delights (Understandable to an extent as it is now seven years old). The film begins with the usual story of isolated bullied school kids who become friends, which makes for a slightly corny if very watchable first hour. The pair tackle their bullies, confront their fears and find escapism from their preoccupied families and stressful situations in a small forest near their homes. 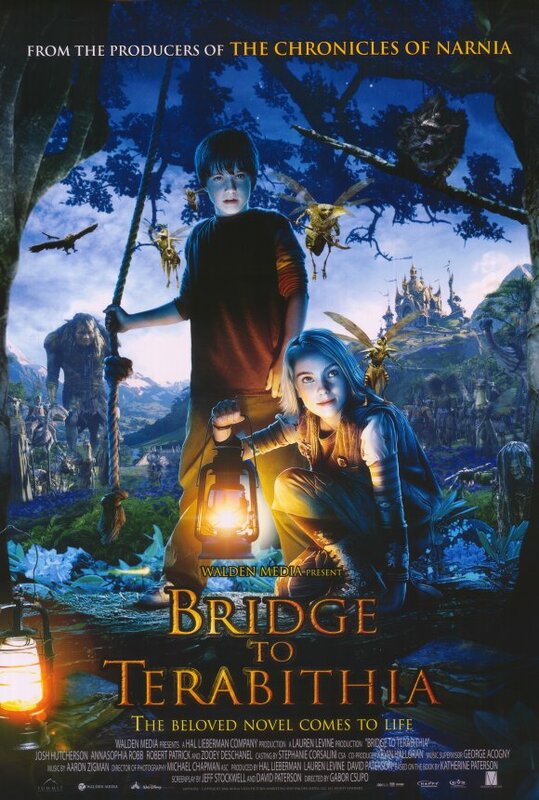 It is a clever touch to see the ‘inhabitants’ of Terabithia reflecting a lot of their problems, with some of the evil crow creatures and trolls mimicking their bullies. An enjoyable romp that in one moment became so much more. I don’t want to say too much about the story because I want people to see this. There was a twist that actually surprised me. *POSSIBLE SPOILERS* An unexpected tragedy transforms this film from a simple journey of two friends bonding and escaping their worries to one of preparing for the dangers of the real world, grief and growing up. A subject matter that is delicately dealt with and brilliantly performed with emotional gravitas. A beautiful drama that mixes fantasy with the real world that may be unexpected for the little ones, so be warned. An uplifting, emotional family drama that is worth a watch. Great writing and a great cast featuring the likes of Robert ‘T-1000’ Patrick as Aaron’s emotionally detached father and the beautiful Zooey ‘New Girl’ Deschanel as the zany music teacher (Why am I not surprised?). It is great to see how far the young leads Hutcherson and Robb have progressed from this beautiful little film to featuring in bigger affairs such as Hunger Games and Charlie and The Chocolate Factory. A surprise for a change.